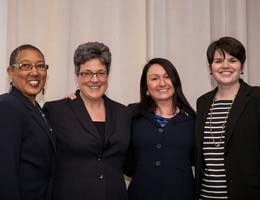 Celebrating 20 years of service, the Tidewater Community College’s Women’s Center hosted a Women’s History Month luncheon to recognize the milestone. “For the last two decades, the Women’s Center has grown from an idea to an office, from an office to four campuses, and from TCC to a model program for women’s centers,” said Jeanne Natali, coordinator of the Women’s Center. Laura Soulsby, educational programming and communications coordinator for the center, added, “Over the last five years, we have charted new territory by expanding programs aimed at increasing students’ readiness for leadership and careers.” New programs include a leadership program that uses national best practices, as well as Instant Career Coaching and an annual Women’s Leadership Speakers Series, which recently featured TCC President Edna Baehre Kolovani. Guest speakers Del. 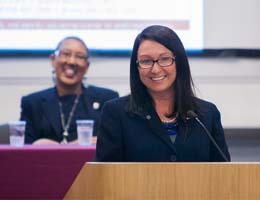 Daun Hester (D-Norfolk) and Spanish Professor Gabriela Toletti also shared stories of success. Hester spoke of her lifelong dream of serving in public office. “My goal was to serve in an elected capacity by age 40. I wanted to be at the table and in those rooms where decisions are made,” she said. Today, Hester is a delegate for the 89th District. “It has not been an easy road, and I lost plenty of races before landing here,” she said. 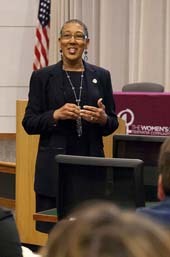 Hester served on the Norfolk City Council from 1996 to 2010 and was Norfolk’s vice mayor from 2004 to 2008. Passionate about education, Hester began her career as a teacher for troubled youth, and today she serves as principal of the Calvary Christian Education Center. Toletti spoke of growing up in Uruguay and her dedication to her studies, especially English as a second language. “My mother insisted that I learn English, because she wanted me to have the tools I’d need if I ever wanted to live in another country. So while the girls I knew took ballet and art classes, I studied English,” Toletti said. Toletti earned her bachelor’s in clinical psychology from the University of Uruguay and a degree in teaching English as a Second Language (ESL) from the Alianza Cultural Uruguay – Estados Unidos de Norteamérica. She received an M.A and a Ph.D. in Latin American Literature from the State University of New York at Buffalo. After graduation, Toletti found her calling in teaching, and has been sharing her knowledge of Latin American culture, history, literature and language with students since that time. Toletti and her American-born husband travel to Uruguay to connect with her motherland every year.